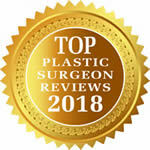 Dr. Keith Blechman offers blepharoplasty palstic surgery (upper and lower eyelid surgery) at his Upper East Side NYC plastic surgery practice. With age, the muscles around the eyes weaken and the overlying skin may become loose. This process may lead to drooping skin and bulging fat which creates a tired-looking appearance. Surgery to rejuvenate the eyelids, referred to as a blepharoplasty, removes excess skin and fat from the area. This will result in a younger, more refreshed appearance to the eyes and face. Upper and lower blepharoplasty can be combined separately, together, or in combination with another procedure such as a facelift. During your consultation Dr. Blechman will discuss your desires and expectations with you, and an individualized plan tailored to your needs will be explained. Surgery lasts approximately one to two hours and is typically performed under sedation. An upper blepharoplasty is performed by making an incision in one of the natural creases of the upper eyelid, thus concealing it. In the lower lid, a blepharoplasty incision is usually made just below the lash line, or on the back of the lid so that there is no visible scar. Only the necessary amount of excess skin and fat are removed. Patients with thyroid problems, dry eyes, high blood pressure, diabetes, or any medical conditions related to the eye may need to consult first with an ophthalmologist about whether they can proceed with surgery. Patients go home the day of surgery and are permitted to walk around and commence with light activities. Swelling and bruising are expected. Cold compresses are applied to the area, and a lubricating ointment will be applied to the eyes as a protectant. Stitches are removed in less than a week and most patients return to work once they are removed. Results will begin to be evident within days to weeks once the swelling starts to resolve. The final result should be evident by one to two months after the surgery and will last for many years. 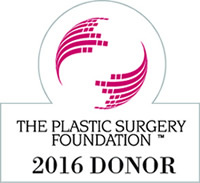 Complications from blepharoplasty are uncommon. 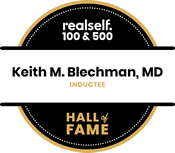 As an experienced, board-certified plastic surgeon, Dr. Blechman takes a conservative and educated approach to blepharoplasty, and will discuss in detail all the risks, alternatives, and benefits prior to performing surgery.